William Randolph was born on 16 January 1770 at Tuckahoe Plantation, Goochland Co., VA. He was the son of Col. Thomas Mann Randolph and Anne Cary. John Carter married Elizabeth Hill. John Carter was born in 1689. He was the son of Robert Carter and Judith Armistead. [S689] Jonathan Daniels, Randolphs of Virginia. [S676] Gary Boyd Roberts, Presidents 2009 Edition, page 33. Lyman Ellsworth McWhorter was born on 1 September 1854 at Montgomery, Montgomery Co., AL. He was the son of Major Eliphalet Ariel McWhorter and Anna Gore Shepherd. Lyman Ellsworth McWhorter died on 12 September 1905 at St. Marys, Camden Co., GA, at age 51. [S691] Nancy J. Pennington, "Isaac Phelps." Major Eliphalet Ariel McWhorter was born on 22 July 1830 at Edgefield District, SC. He married Anna Gore Shepherd, daughter of Job Shepherd and Abigail Sage Ellsworth. Major Eliphalet Ariel McWhorter died on 16 January 1898 at Jacksonville, Duval Co., FL, at age 67. He was buried at Oak Grove Cemetery, St. Marys, Camden Co., GA.
[S685] Chet Leo Spencer, "William Spencer," e-mail to James H. Holcombe, 25 March 2009. [S686] Rev. Frederick Wallace Pyne, Pyne's Register, page 510. [S688] Paul C. Nagel, Lees of Virginia. [S298] Donald S. Barber, Thomas Barber 2nd Ed, page 77. [S298] Donald S. Barber, Thomas Barber 2nd Ed, page 76. William L. Browning was born circa 1905 at WV. He was the son of William Lloyd Browning and Hattie Lorene Corpening. [S298] Donald S. Barber, Thomas Barber 2nd Ed, page 31. Nathaniel Harrison was born circa 1763.1 He was the son of Benjamin Harrison V and Elizabeth Bassett.1 Nathaniel Harrison died; unmarried. [S686] Rev. Frederick Wallace Pyne, Pyne's Register, page 380. Capt John Stith married Mary Randolph, daughter of William Randolph and Mary Isham. Elizabeth Oviatt was born on 23 April 1786 at Goshen, Litchfield Co., CT. She married Elisha Ellsworth, son of John Ellsworth and Hannah Birge, on 26 November 1808 at OH. Elizabeth Oviatt died on 12 September 1859 at OH at age 73. Charles Carter married Ann Butler Moore. Charles Carter was the son of John Carter and Elizabeth Hill. William was a colonist and land owner who played an important role in the history and government of the Commonwealth of Virginia. He moved to Virginia sometime between 1669 and 1673, and married Mary Isham a few years later. His descendants included several prominent political figures, including Thomas Jefferson and John Marshall. Genealogists have taken an interest in him for his progeny's many marital alliances, referring to him and Mary Isham as "the Adam and Eve of Virginia". William Randolph was born in Moreton Morrell, Warwickshire, England, to Richard Randolph (1620–1671) and Elizabeth Ryland (1625–1699). Like several other immigrants from the English gentry, he was a second son. William was educated at home, concentrating his studies on Greek, Latin, and law. His uncle, Henry Randolph, emigrated to North America in 1642 and rose to the position of Clerk of the Colony. Henry paid a visit to England in 1668 and may have encouraged his nephew to emigrate. Henry died a few years after William arrived in Virginia. The Randolphs were established gentry, in England, meaning that they had property and a family tradition of knightly military service signified by a coat of arms. Although the family can be directly traced back only as far as 1500, the name appears in the Domesday Book and there is a distinguished Scottish family with which they may have been connected. There is better evidence that they were descended from Surety Barons of Magna Carta through a female line. The historian David Hackett Fisher shows a chart illustrating gentry intermarriages in which the Randolphs and Ishams figure. 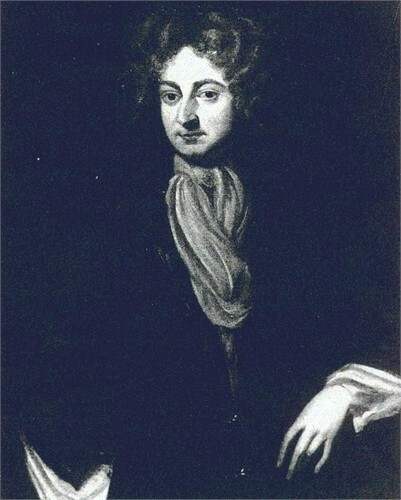 Although there is no record of William's attending a university, his half-uncle Thomas Randolph was an Oxford don and noted poet. After his arrival in Virginia, Randolph began working as an "undertaker" (building contractor), before turning to tobacco farming. Even after he had acquired property, a tax roll refers to him as "William Randolph, Merchant". At some point he owned a ship which traveled between Bristol, England and his dock at Turkey Island. Randolph's early acquisitions were in the neighborhood of Turkey Island. This land had been settled for decades, and was held by several owners, from whom he purchased. Possibly his first purchase was 591 acres (2.39 km2) of land on Swift Creek, south of the James. In 1676, the colonist Nathaniel Bacon rebelled unsuccessfully against the colonial government, and his estate, Curles, was forfeited. Randolph made an assessment of the estate for Governor Berkeley and was allowed to buy it for his estimated price, adding 1,230 acres (5.0 km2) to his land holdings. This conflict of interest was criticized by his neighbors. After the capital of Virginia moved from Jamestown to Williamsburg in 1699, Randolph was able to use his political power and influence to acquire almost 10,000 acres of land in the vicinity of Richmond; a 3,256-acre tract at Tuckahoe Creek and a 5,142-acre plot at Westham. This land became the basis of the Tuckahoe and Dungeness Plantations founded by two of his sons. William Randolph owned a considerable number of slaves. This reflected the rise of slavery during his business career. Around 1675, Governor Berkeley reported that the population of the colony was 40,000, with 4,000 indentured servants and 2,000 slaves. But as the supply of indentured servants declined late in the 17th Century, the planters turned to slaves for work in the labor-intensive business of tobacco culture. It is difficult to determine the acerage or number of slaves he owned at his death. His will has been transcribed and a copy appears on the internet. One estimate is that he had 20,000 acres (81 km2). He paid property taxes on 1,655 acres in Surry County and 19,465 acres in Henrico County in 1704. Randolph held multiple official appointments. At the local level, he became clerk of Henrico County Court in 1673 and held the position until he was asked to serve as a justice of the peace in 1683. He also served as sheriff and coroner. In addition, Randolph represented Henrico County in every assembly of the House of Burgesses from 1684 to 1698, was the Speaker of the House of Burgesses in 1698, and was the Clerk of the House from 1699 to 1702. He fell ill in August of 1702 and his son, William, took his place. Randolph resigned the clerkship completely in March of 1703. Randolph was also one of the founders and first trustees of the College of William and Mary. His son, John Randolph, was awarded a knighthood on a trip to London to secure a royal charter for the College. Randolph was a friend of William Byrd and served as an advisor to Byrd’s sons during their political careers. He is mentioned in one of Byrd's diaries without the supercilious tone Byrd employed with most of his contemporaries, no small character reference. Byrd also describes a visit to Tuckahoe Plantation around 1733. He built a mansion on the Turkey Island plantation on high ground overlooking the island and the river. It featured a ribbed dome and was known as the "Bird's Cage". With William Randolph as its patriarch, the Randolph family became extremely well-respected in Virginia. Randolphs and close relatives formed the predominant political faction in the colonial government during the 18th Century, with many members of the elected House of Burgesses and the appointed, and more exclusive, Council. The Randolphs, like the rest of the Virginia gentry, strongly supported the Revolution. Turkey Island derives its name from the first explorers of the James River, who noted that it contained a large population of wild turkeys. The term can refer to the surrounding area as well as the island. William Randolph's residence overlooked Turkey Island, and he is buried near the site of the house. Tuckahoe was the Native American name for and edible water plant. It became a pejorative reference for members of elite Tidewater society. It is highly likely that the cultural term tuckahoe derives from Tuckahoe Plantation, established by William Randolph's son, Thomas. Tuckahoe is the only remaining intact plantation of William's sons. Dungeness is the headland of a shingle beach in Kent, England. The founder of Dungeness Plantation, Isham Randolph, spent several years of his youth in England, which may explain the choice of name. William Randolph was born on 22 November 1720.1 He was the son of Col. William Randolph II and Elizabeth Beverley.1 William Randolph married Anne Harrison, daughter of Benjamin Harrison IV and Anne Carter, in 1735. [S752] Burke's Peerage Limited, Presidential Families, page 40. [S686] Rev. Frederick Wallace Pyne, Pyne's Register, page 557. [S686] Rev. Frederick Wallace Pyne, Pyne's Register, page 526. Francis Browning was born circa 1910 at WV. He was the son of William Lloyd Browning and Hattie Lorene Corpening. Marjorie Pay married Gordon Bitner Hinckley, son of Bryant Stringham Hinckley and Ada Bitner, in 1937 at Salt Lake City, Salt Lake Co., UT. Marjorie Pay died on 6 April 2004. Thomas Nelson Jr. was born on 26 December 1738 at Yorktown, VA.1 He married Lucy Grymes, daughter of Philip Grymes and Mary Randolph, on 29 July 1762 at Williamsburg, VA.1 Thomas Nelson Jr. died on 4 January 1789 at Mont Air, Hanover Co., VA, at age 50.1 He was buried at Grace Churchyard, Yorktown, VA.
Thomas was a signer of the Declaration of Independence, representing Virginia in the Continental Congress and was its Governor in 1781. For most of his life, Thomas was usually styled Jr. to distinguish him from his uncle of the same name. He used this designation in signing the Declaration of Independence. At 14, Thomas was sent to school at Hackney, England, after which he entered Christ's College, Cambridge. In 1761 Thomas Nelson was elected from York County to be its representative in the House of Burgesses. By 1766, with the Stamp Act crisis, Thomas bean to take an active role in the House of Burgesses an ardently supported the patriot cause as the crisis with the mother country continued to deteriorate. [S686] Rev. Frederick Wallace Pyne, Pyne's Register. [S686] Rev. Frederick Wallace Pyne, Pyne's Register, page 513. Tommy Hathaway was born in 1874. He was the son of Murray Lindley Hathaway and Emma Liza English. [S686] Rev. Frederick Wallace Pyne, Pyne's Register, page 817. [S686] Rev. Frederick Wallace Pyne, Pyne's Register, page 818.